MMP Architects - Independent architecture practice based in Macclesfield, Cheshire. Hollin Hall is situated on the outskirts of Macclesfield close to many national and international communications networks. Part of the Best Western chain of hotels. it attracts a large number of guests and functions all year round. 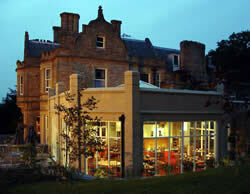 When the hall was originally converted into a hotel, a large conservatory was added at the rear of the property. The owners wanted to replace the conservatory with a more permanent structure which would accommodate up to 75 dining seats with a bar area, as well as provide an additional function room for year round use. A contemporary design was preferred which would complement, rather than duplicate the existing building. After initial discussions and sketches of perspectives, MMP were appointed as architects in charge. As Hollin Hall is a Grade 2 listed building, they had to work with the local planning authorities to gain approval for the building work and then oversee all construction to ensure that it remained within regulations. To avoid disruption of the day-to-day running of the hotel, a very tight building schedule was agreed during the winter months, when the hotel was traditionally quieter. Working with the builders and interior design company, the project was completed on budget and within the six months originally agreed. Since completion of the project MMP Architects have been asked to submit a new five year development plan for the hotel.